What Can We Do to Solve the West’s Water Crisis? There’s disagreement over the extent of the problem and what can be done to fix it. ProPublica has asked some of the leading thinkers on water management issues to weigh in. There’s a historic water crisis unfolding in the American West, with increasingly urgent drought reports from California to Colorado. But so far, the balance of focus has been on the climate, not on ourselves. This week, ProPublica and Matter begin publishing Killing the Colorado, a multi-part series by Abrahm Lustgarten investigating the truth behind the water crisis in the West. In his report, Lustgarten explains how man-made policies and practices have helped drive today’s crisis. If our decisions brought us here, what will it take to solve the problem? To explore this question, we are gathering some of the smartest thinkers on water management issues to discuss the causes, perils and potential solutions surrounding the current crisis. It will be a virtual water crisis conference, featuring expert voices from different perspectives, including farming, the environment, water law, science and policy. Our panelists have been paired up to tackle questions like: What exactly is the water crisis all about? How does the drought affect the price of fruits and vegetables we buy every day? And why, in 2015, are we still operating under a century-old water rights policy? We also encourage you to ask our panelists questions and share your thoughts in the responses below. The Conversation: Why can’t we find a solution to the West’s water crisis? There are a lot of players in the game of drought: Farmers from the seven Colorado Basin states, politicians in the West, experts looking for policy changes in some of the region’s arcane water laws, and the environmentalists fighting for conservation big and small among them. In the Killing The Colorado series, we showed that this unfolding water crisis is man-made, not just the result of a lack of rain. What should be done to respond to this crisis? We brought in Doug Kenney, the director of the Western Water Policy program at the University of Colorado Boulder, and George Frisvold, an economist at The University of Arizona to help us imagine a way out of the current water crisis. The Conversation: Today’s water laws encourage waste. Can big data help shape better ones? “Use it or lose it” water policies — a cornerstone of water rights laws across the West — are encouraging ranchers and others to use precious water supplies whether they truly need them or not. 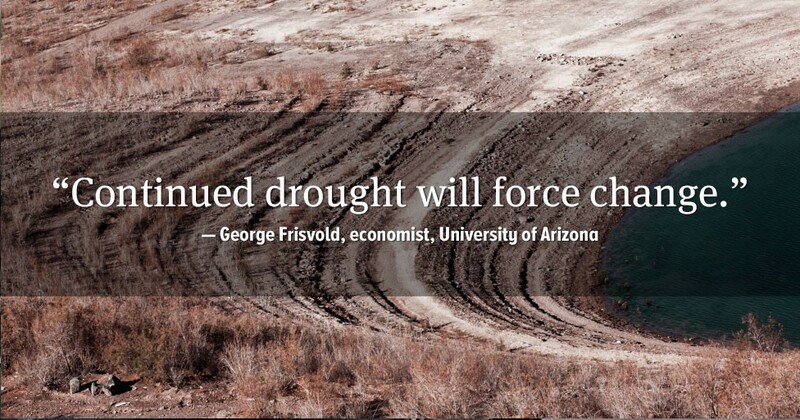 How is this century-old policy affecting the drought? Are these policies effective? We asked Peter Gleick, founder of the Pacific Institute, to talk about the costs and benefits of “use it or lose it” policies with Paul Wenger, the California Farm Bureau Federation President, starting with the central question: Should our water rights laws change? The Conversation: How do we meet our 21st century water needs? The Colorado River’s water is divided entirely between farmers and cities, with little left to support the ecology of the river system itself. Why does that matter? And should more water be left in the Colorado to help it thrive We thought it would be interesting to have an environmentalist and the CEO of a major urban water utility discuss this. 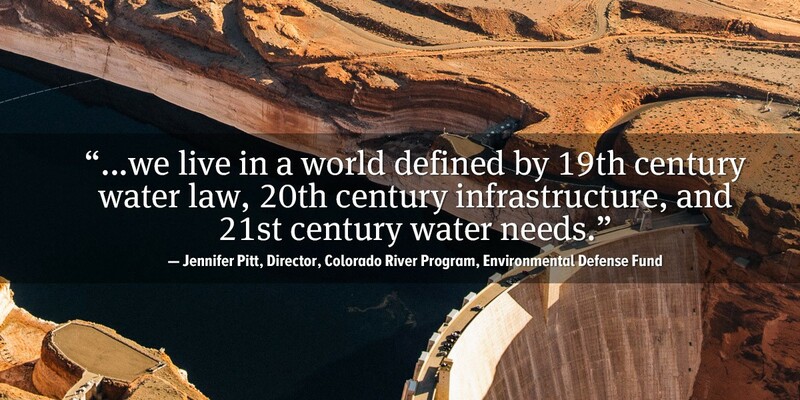 We paired Jennifer Pitt, director of the Colorado River Program for the Environmental Defense Fund, and Jim Lochhead, CEO of Denver Water, which provides water for more than one million people in the city and county of Denver, to tackle the question. 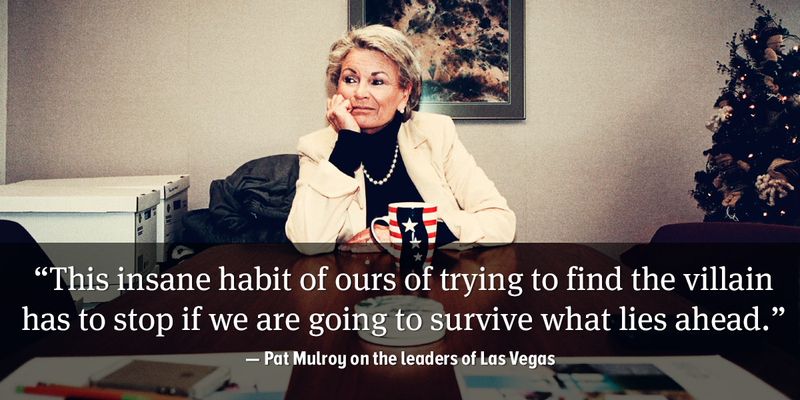 The Conversation: Can cities keep growing in the desert? The Conversation: Cutting Water Use: Focus on Cities or Farms? Farmers now use the majority of the West’s water resources. Are the crops they grow a priority or should they reduce their water use? Can curbing urban consumption make enough of a difference? 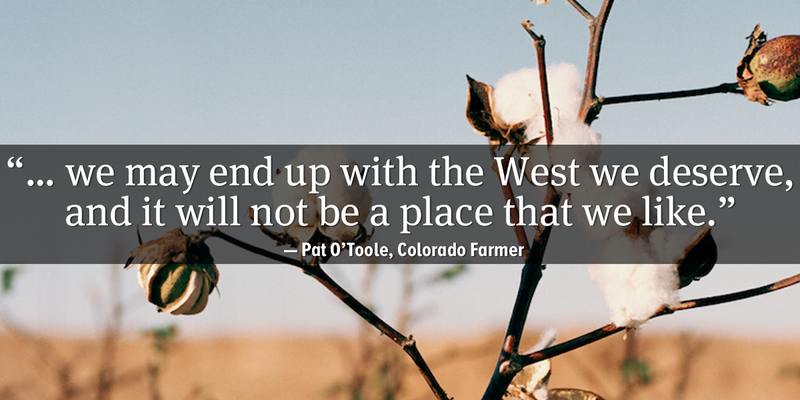 Colorado farmer Pat O’Toole and water expert Robert Glennon of the University of Arizona discuss where water cuts should come from, the future of farming, and the consequences of not opening our eyes to the unfolding water crisis.